I'm not sure what it is about Essie but lately I've been so in love with every shade. 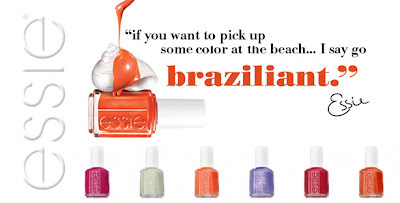 It might be because its summer and their is just so many fun colors to play with to spice up any outfit, or just the fact that they are fun, and not obnoxious like some bold colors this summer. I don't want my nails to look like a highlighter by all means. These colors are to die for! I'm so in love with the color Absolutely Shore its more of a sea foam green color with a hint of pearl.